Because I believe in rewarding my students for good behavior (ie. bribing them to not swing from the studio’s ballet barres) I returned to my favorite bargain basement for a stroll down the toy aisle. The result, in a word, was horrific. Just in case you can’t read the little thought bubble, it says “I chalk it up to my PhD in fashion.” Well now! PhD Barbie! I’m not really sure why Dr. Fashion is providing instruction in what appears to be basic algebra but who knows… maybe tenure-track positions in one’s field are just as hard to find in Barbie-land as they are in the real world. 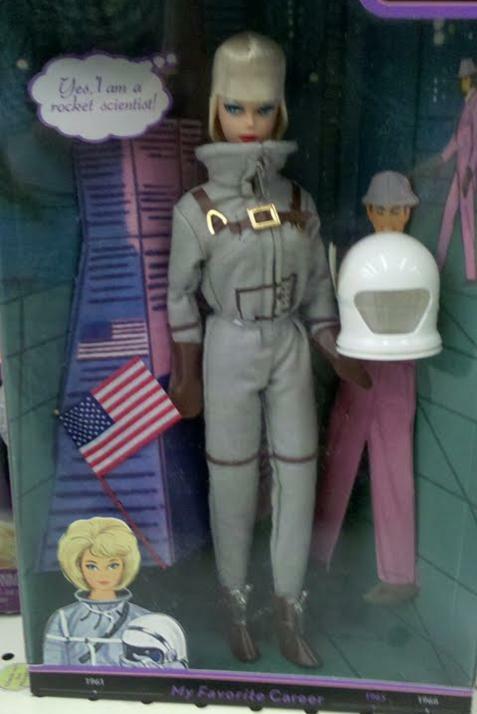 I know she’s a rocket scientist not because she’s dressed like one but because it says so in her little bubble. Far be it from me, but do rocket scientists really sit around in astronaut gear all day? I always thought rocket scientists were the one’s who built the rocket ships, not the ones who manned them. And although I’m impressed by Mattel’s nod to career paths that do not revolve around becoming a princess, there’s no way I’m getting any of these dolls for my students. In fact, I’m going to probably stick with stickers. My Single Male Friend Friday: Meet Carl! 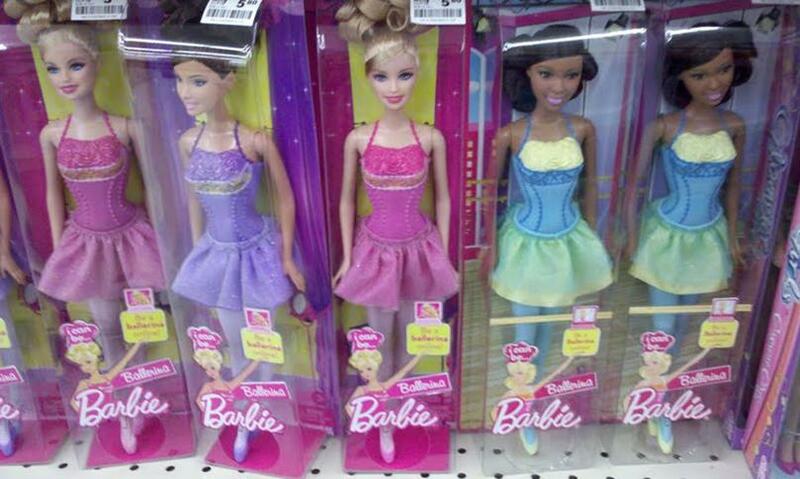 I could not stand Barbies as a little girl, I just didn’t like them. 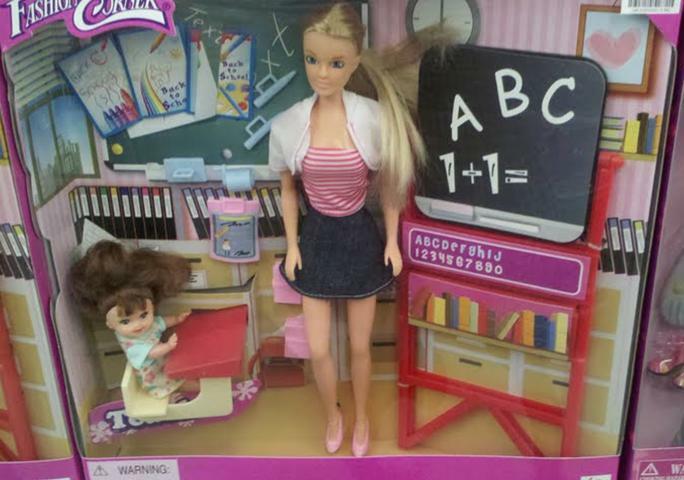 I find that hilarious with the one teacher Barbie, she does look like a drop out and that would not pass for any teacher’s outfit! I did love stickers, so I’m sure the kids will go crazy for them as a nice little reward for their good behavior. Ah, so lest Barbie be accused of being intelligent without the virtue of being slutty: voila an inappropriate teaching outfit! I enjoy reading your blog, btw. I kind of like the ballerina Barbies because when your four year old takes off their clothes they still have clothes on. Only the tutu really comes off. As opposed to the 17 hand-me-down ones that are truly and eternally naked. Did you know that most astronauts (and please someone correct me if I’m wrong) from the military are from the US Navy? Original astronauts were mostly test pilots and such from the Navy. Most current astronauts are degree holding Navy/Air Force personnel, not hot-shot thrill seekers. My favorite is teacher Barbie. I WISH I had a teacher that looked like THAT.